The Fortnite Week 9 Challenges are set to go live early on Thursday April 19, for all Battle Pass holders to take on. In this Fortnite Week 9 Challenges guide, we’ll be running down every single week 9 challenge for the latest set as part of Fortnite Season 3. If you instead need anything else on Fortnite, including how to master the Battle Royale mode, as well as where you can find the very best weapons and Vending Machines scattered across the Battle Royale map, make sure to head over to our Fortnite guides hub. Once again the Fortnite weekly challenges leaked early, meaning we can bring you the Fortnite Week 9 Challenges ahead of time. These have proven to be accurate in the past, so you can find the complete list of week 9 challenges for Battle Pass holders just below. Complete all of these challenges, and you'll be rewarded with a hefty payout of 4,000 XP. 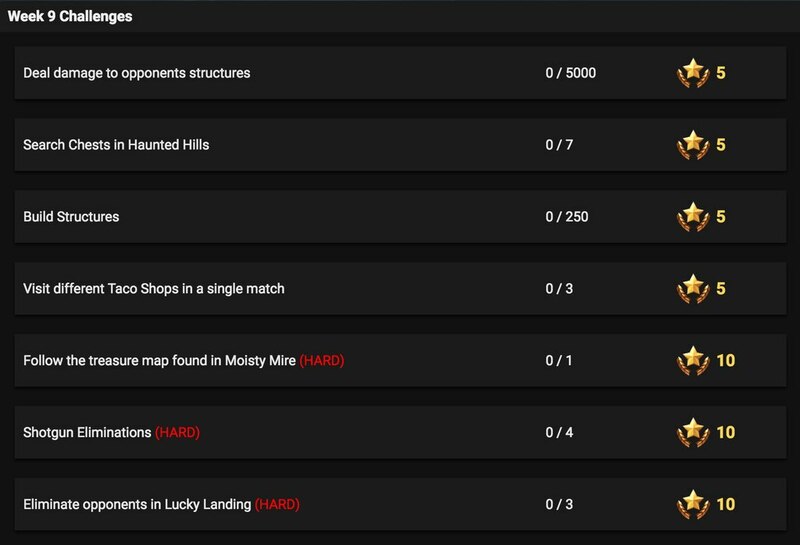 As you can see from the list just below, the Fortnite Week 9 Challenges are as mixed as always, tasking players with activities like reaching three Taco Shops in a single match, and following the treasure map found in Moisty Mire on the Fortnite Battle Royale map. Deal Damage to Opponents' Structures - 5 stars - Complete this week 9 challenge by dealing 5000 points of damage to opponent structures. Search Chests in Haunted Hills - 5 stars - Once you know where the chests are, this week 9 challenge should be pretty simple. Build Structures - 5 stars - Simply build 250 items to complete this week 9 challenge. Visit Different Taco Shops in a Single Match - 5 stars - From the five Fortnite taco shops, you simply have to visit three of them in a single match to complete this week 9 challenge. Follow the Treasure map Found in Moisty Mire - 10 Stars - Once the map has been found, it should be pretty simple to complete this week 9 challenge. Shotgun Eliminations - 10 stars - Whatever your shotgun of choice, make four kills using one of them to complete this week 9 challenge. Eliminate opponents in Lucky Landing - 10 stars - Reach Lucky Landing and then eliminate three opponents to complete this week 9 challenge. If we break down the Fortnite Week 9 Challenges one by one, some should be a lot easier to complete than others. The Deal damage to opponents' structures and Build Structures week 9 challenges should be pretty easy to do if you give them enough time, and should more or less come from playing the game normally. Of the elimination week 9 challenges, the Shotgun Eliminations challenge should be the easiest, but the Lucky Landing elimination challenge will be tougher as this is a hard area to stay alive in. Even getting to Lucky Landing can be pretty tough. The search-oriented week 9 challenges in Fortnite are a mixed bag, too. You shouldn't have too much trouble searching for chests in Haunted Hills, but visiting three taco shops in a single match may prove tricky due to needing to stay alive for quite a while. Following the treasure map found in Moisty Mire is likely to be pretty simple, once the map is found. We might be all done with this Fortnite Week 9 Challenges guide, but make sure to continue ahead to our Fortnite skins page where we’ll rank the best outfits available in the game, or out Fortnite Mobile guide if you want to know how to download and play the game on the go.